Ambassador Philippe J. Lhuillier (left) discusses his plans with Ms. Pilar Terren Lalana (right). Last April 07, the new Philippine Ambassador to the Kingdom of Spain, H.E. Philippe J. Lhuillier, presented the open copy of his credentials to the Office of the Chief of Protocol of the Spanish Ministry of Foreign Affairs. He was received by the Subdirector General of the Chancellery, Ms. Pilar Terren Lalana, on behalf of the Chief of Protocol (Mr. Juan Sunye Mendia) who had to go on an official mission abroad at the time. Ambassador Lhuillier was accompanied by the Philippine Embassy´s Minister and Consul General Emmanuel R. Fernandez. Under the rules of Spanish protocol, a new Ambassador must first present the open copy of his credentials to the Chief of Protocol prior to presenting the original to His Majesty, The King. After presenting the said open copy, the new Ambassador can perform all his duties and exercise all his rights as his country´s envoy to Spain, except participating in functions where the King and/or the Queen would be present. The Royal Household will then schedule a day when he can present his original credentials to the King in elaborate ceremonies that date back hundreds of years. During his talk with Ms. Terren, Ambassador Lhuillier spoke about his plans for further deepening the economic, political, social and cultural relations between Spain and the Philippines. He said that although he will continue the current focus of the Philippine Embassy on promoting trade and investments between our two countries, he intends to broaden the scope of the Embassy´s thrusts to include other areas such as educational and cultural exchanges and security cooperation. He also said that this year is the best time to expand the frontiers of our bilateral relations since 2017 marks the 70th anniversary of the establishment of diplomatic ties between our two countries. Ambassador Lhuillier presenting the open copy of his credentials to Ms. Pilar Terren Lalana. For her part, Ms. Terren lauded the long ambassadorial experience of Ambassador Lhuillier. Having previously served in countries such as Italy, Albania, San Marino, and Portugal, Ms. Terren said that the new Ambassador has definitely gained an expertise on Southern European matters – a credential that will surely serve him well in his new mission as the Philippines´ top envoy to Spain. 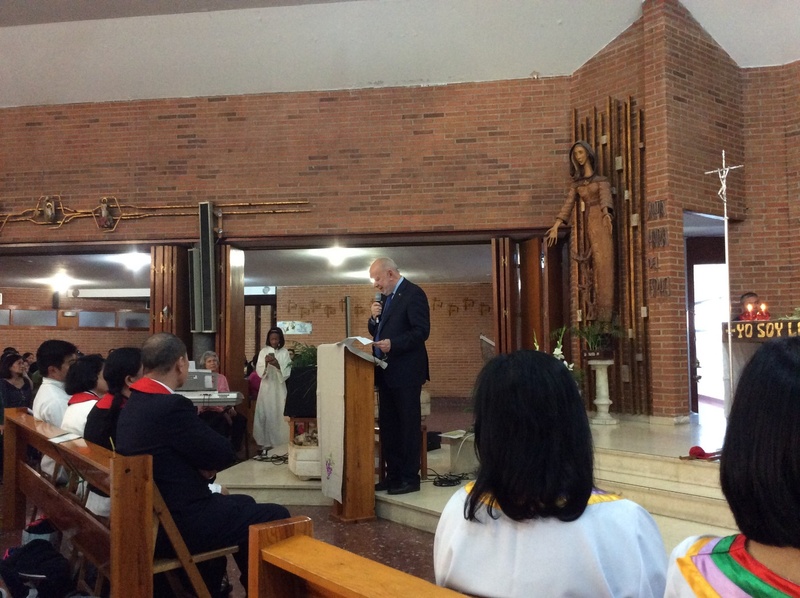 A couple of days later, on April 09, Ambassador Lhuillier officially met the Filipino community in Madrid for the first time at the Parroquia de Nuestra Señora del Espino. He was accompanied by his wife, Madame Edna Lhuillier, and the officers of staff of the Philippine Embassy in Madrid. In his address to the Filcom, Ambassador Lhuillier again spoke of his plans for the Philippine Embassy in Madrid, particularly, of his desire to further enhance its service to Filipinos. He then urged the leaders and members of the Filipino community gathered during the occasion to continue extending their support and assistance for the Embassy´s projects and plans for the Filcom. Ambassador Lhuillier delivering his message to the Filipino community in Madrid.